Jeff Lemire wraps up a superlative run with Animal Man Vol. 5: Evolve or Die. Though comics may be surprising or shocking or interesting, it's a rare book that can take 20 pages of panels and images and really make them emotional, and Lemire has consistently achieved that throughout, including in this book's conclusion. I would say that Evolve or Die was in totality perhaps my least favorite volume of Lemire's Animal Man (though the final issue was a knockout), but I can certainly acknowledge the manner in which Lemire completes Buddy Baker's arc and brings the title to a resting place ahead of Justice League United. Lemire's Animal Man, an inaugural New 52 title and maybe the best of the debuts, started out as a modern horror title, with artist Travel Foreman's sketchy, grotesque figures. Though Steve Pugh's work had a more realistic tone, the pendulum swung from horror to sci-fi in the later books, even approaching fantasy with the "Rotworld" crossover. With the fourth volume and the aftermath of Cliff Baker's death, again the book was in realistic territory, entering horror again with the Splinterfolk. 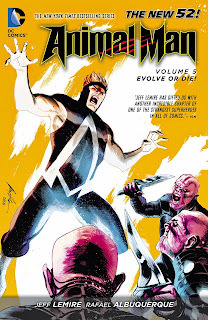 In Evolve or Die, Animal Man swings back one more time, completing the pattern with a final trip to the fantastical, with more rounded, animated art by Rafael Albuquerque and then Cully Hamner. I fully accept that Evolve's overall tone is consistent with the back-and-forth of Lemire's Animal Man series; it's simply my preference that Animal Man tell modern horror stories and not swords and sorcery (much as I like my Batman stories "real" and not supernatural). Lemire's does get just right his final issue #29, however, arguably the toughest issue to land, with a story that blends the real and the fantastic in such a way that neither one takes over, and is, indeed, quite moving. The Animal Man title, through its many iterations, has often been a family comedy wrapped up in superhero horror elements; Animal Man has never been a traditional "capes patrolling the city" title, and even in the darkest moments of the Grant Morrison run, one always had the sense that things would turn out for the best for Buddy Baker. Lemire, having killed off Buddy's young son and estranged Buddy from his family, therefore had the unenviable task in the book's scant final issues of restoring Animal Man's largely happy-go-lucky tone without cheapening the tragedy or too-awkwardly undoing it. Ultimately Lemire succeeded, for the most part. With Buddy having now encountered the Red, the Green, and the undead Rot, not to mention his likely general knowledge of figures like the Phantom Stranger, the Spectre, etc., logically the reader expects Buddy to believe that death is not "the end," as it were. Maxine's fairy tale, as illustrated in the last chapter by Lemire himself, hits the right notes, not lessening the fact that in-story Cliff will never grow up and have a life of his own, but also acknowledging that these characters have plenty reason to believe they'll all be reunited someday. Lemire's Animal Man ends wistfully, to be sure, but the reader can accept Buddy donning his costume and being Animal Man again because of the peace Buddy makes with Cliff's death and the story's profession that Cliff is somewhere safe and happy. I felt less sanguine about the resolution of the conflict between Buddy and his wife Ellen. Their growing estrangement has always been this iteration of Animal Man's weakest part, in that it smacked of an "overemotional wife doesn't understand superhero husband has a job to do" trope. Ellen leaving Buddy was mined from the same vein, and so her returning to Buddy after suddenly realizing daughter Maxine would have animal powers whether Buddy was around or not seems equally sudden. If we're to believe Ellen is as capable as she's portrayed, surely the logic that Buddy has to be Animal Man that comes easily enough to Buddy and the reader should also be apparent to her. The end of this book brings Buddy and Ellen back together, as it should be, but their separation and reunitement never felt quite organic to me. At the same time I appreciated that Lemire didn't sugarcoat their reunion, but rather in the last chapter the reader is left with the knowledge that Buddy is still lying to Ellen, in not telling her that he's promised to one day become the cosmic Bridgewalker. (The "Bridgewalker" chapter, pulling Buddy in medias res into space, seemed partway through like Lemire just marking time, but it ultimately has satisfactory thematic relevance.) What we recognize is that this is a marriage with its own flaws, and Ellen (if portrayed overemotionally) is not entirely wrong to suggest that Buddy compartmentalizes his family and superheroic lives and does not entirely let Ellen in. I liked that Lemire humanized Buddy here at the end, instead of just letting him walk off heroically into the sunset. We're left with the idea that Buddy's adventures will continue (in Justice League United, of course, but also just in our imaginations), and that good times but also bad times still await him. Even as Animal Man fighting a super-powered Brother Blood on the shores of the magical Red kingdom might not be my go-to choice, Jeff Lemire ends Animal Man with rousing superheroic sequences; he also gives good depth to the New 52 Brother Blood character, whom I'm hoping some other writer will pick up and use. With Animal Man Vol. 5: Evolve or Die, Lemire brings to a close an undisputed classic of the New 52; at thirty issues plus annuals and a couple of Swamp Thing issues, this is a run that deserves to be read all at once, and would make a nice all-in deluxe hardcover collection, I think.